Hop on an urban safari in Joburg with the red bus! 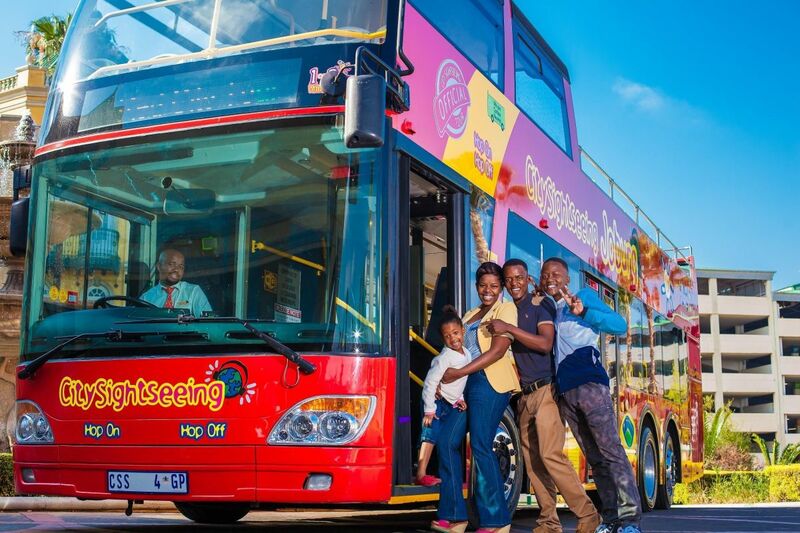 Enjoy a city safari with the kids on a City Sightseeing bus tour in and around Johannesburg. Image: Family fun days on the on the red bus. In the mood for a Sunday fun day? Look no further and buy City Sightseeing’s Sunday Sizzler ticket at a special price online. Your ticket allows you onto the Green and City Tour buses for a day of jam-packed activities. The tour starts at The Zone @ Rosebank and includes some of the attractions below. On the Green Tour through Johannesburg’s lush northern suburbs, hop off at Zoo Lake (stop 2) to enjoy relaxing activities for kids and adults – from enjoying a picnic surrounded by the gorgeous scenery to feeding the resident ducks or renting a brightly coloured paddle boat for a cruise on the lake. Hop off at the Johannesburg Zoo (stop 3) for a bush and wildlife experience in the middle of the city. You will even have an opportunity to see South Africa’s Big Five (lion, leopard, elephant, rhino and buffalo). Spend at least two hours here getting to know our magnificent African animals, as well as those of the Amazon, such as spider monkeys, armadillos and pumas. There are lots of vendors in and around the zoo for those who wish to purchase mementos of the trip. For prices and entrance fees, click here. Another stop for those with an interest in history is at the Museum of Military History. Visitors have the option to go through exhibits that take them through the Anglo-Zulu War. The South African War (also known as the Anglo-Boer War). You will learn about South Africa’s role in World War I and World War II and movements such as Umkhonto we Sizwe, the armed wing of the African National Congress. Once the bus reaches Constitutional Hill (stop 5), you have the option to change buses and hop onto the City Tour bus to see more of the city. Gold Reef City Casino Hotel (stop 13) is a world of its own with lots to do and explore. Here you will go underground and explore mine shafts. You also have the option of going on a heritage tour, or enjoying Gold Reef City Theme Park’s thrilling rides, such as the Anaconda, Tower of Terror, Golden Loop and the Jozi Express roller coaster. See detailed theme park prices here. Stop 15 on the City Sightseeing red bus route is at the SAB World of Beer in Newtown. Here, you get to explore the role of beer in African culture. A combined beer tour and tasting allows you to learn about the rich history of South African Breweries. Expect to taste traditional African beer (umqombothi), and learn about the history of beer making in Africa and across Europe. Parents travelling with kids can also pop in at the Sci-Bono Discovery Centre just a quick walk from the SAB World of Beer. The centre offers innovative and dynamic learning experiences, with a focus on maths and science. The 223m Carlton Centre (stop 11) in downtown Johannesburg is the tallest building in Africa. Visitors can climb up to the top floor of the 50-storey building for panoramic views of the City of Gold. The construction of the building began in 1967 and ended in 1974 even though the centre officially opened in 1973. Today it is a buzzing shopping centre. The Carlton Centre complex was once home to the five-star, 30-storey Carlton Hotel and during its prime years housed many famous guests, including former French president François Mitterrand, Hillary Clinton, former British Prime Minister Margaret Thatcher, and singers Whitney Houston and Mick Jagger. 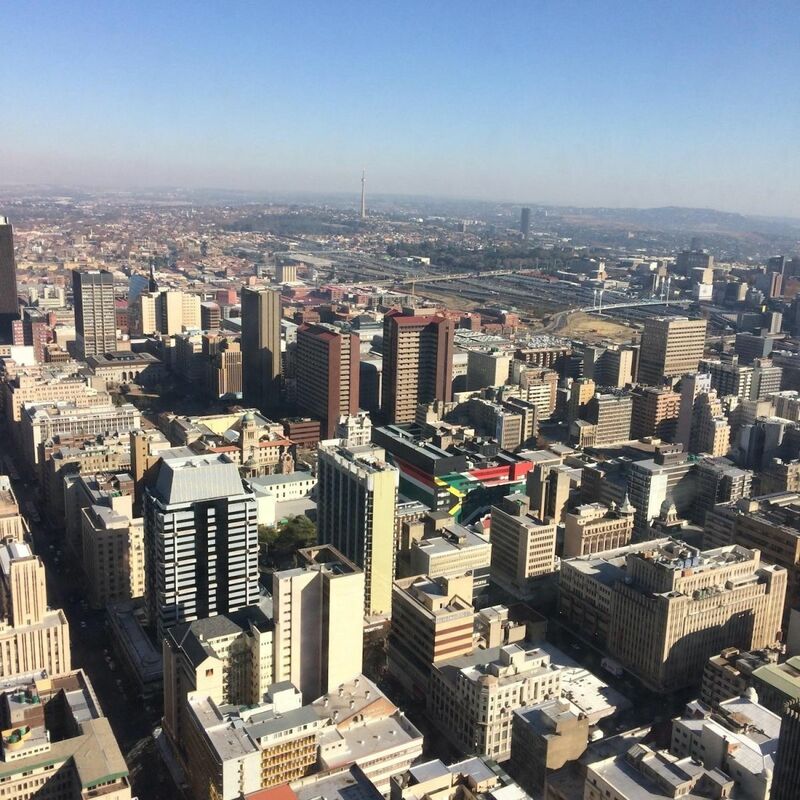 Image: Birds eye view of Joburg city centre on the rooftop of the Carlton Centre building. Buy your City Sightseeing tickets online and save. Note that entry to the attractions is not covered by your City Sightseeing ticket.